Shame one side of my headphones quit working today. London is 8 hours ahead of Pacific Coast Time. There's a programme that starts 6:30 am, 10:30pm here that follows a news section. "Get lively every morning with the breakfast show. Expect lots of great music, news headlines, a look at the papers, regular sports updates and a daily Pause for Thought." it's a 3 hour show, so until 1:30 am here. 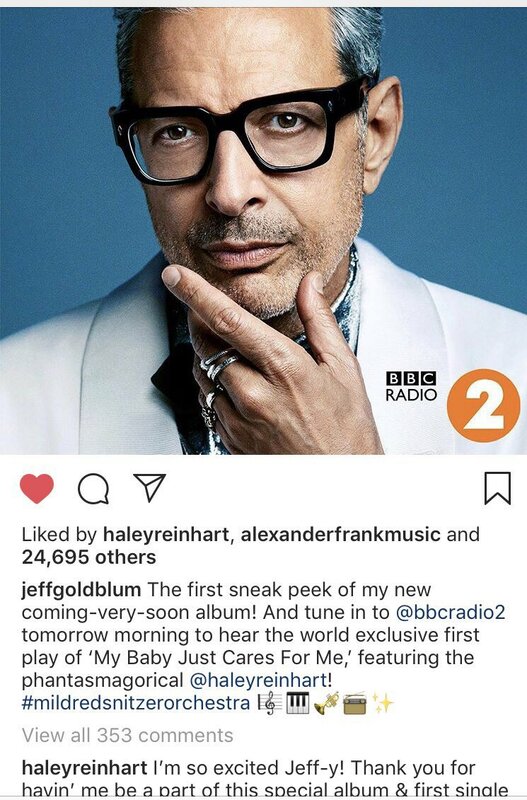 BTW, PMJ's Sarah Reich just put out an album, on it, Maiya Sykes and Scott Bradlee perform......."My Baby Just Cares For Me"
You might say #jeffgoldblum is impressed with @HaleyReinhart . Current time: 04-18-2019, 06:41 PM Powered By MyBB 1.8.19, © 2002-2019 MyBB Group.